This series may be short-lived, with just two dates, yet it serves as a lesson about how much may be learned when one explores a coin type in depth. 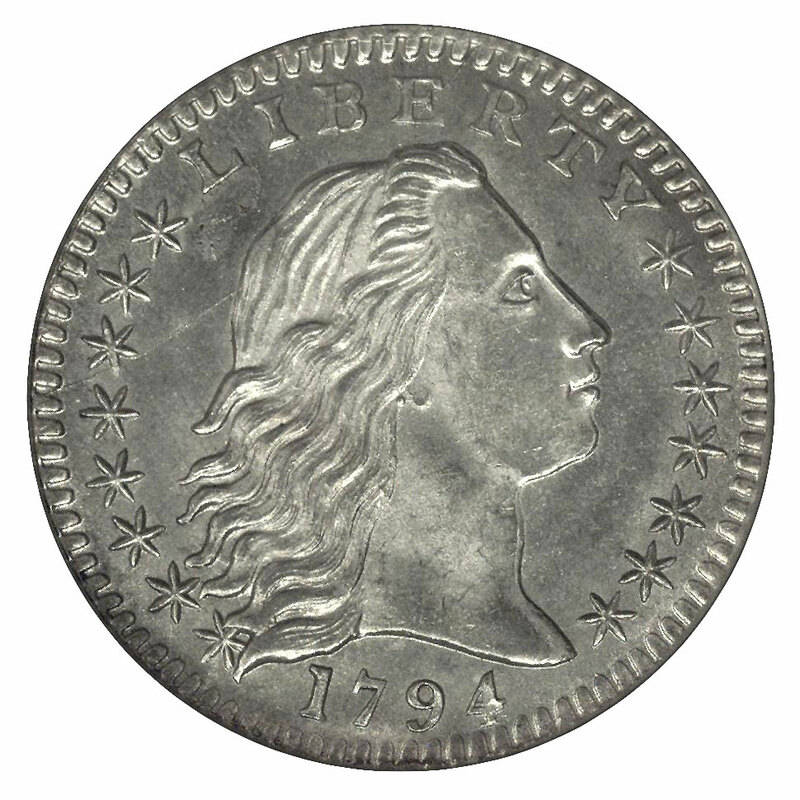 Though half dimes were struck and released in small numbers during 1792, Robert Scot's Flowing Hair type is considered the first regular emission of this denomination. Both the 1794 and 1795 issues were struck and delivered during the latter year. 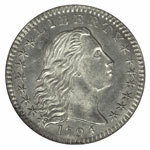 The 1794 half dimes are scarcer than the 1795 pieces, but neither date is truly rare. There are four known die marriages for 1794 and ten for 1795, as well as various die states within those varieties. The peculiarities of each variety are of interest mostly to those specializing in this series. For the type collector, however, the book Federal Half Dimes 1792-1837 by Russell J. Logan and John W. McCloskey is still quite instructive. It serves not only as a guide to which varieties are sufficiently available to provide an affordable type coin, it also reveals those varieties that typically are not well struck and in which places their weakness appears. Some generalities regarding striking quality may be made for coins of this type, and these are addressed in The Official American Numismatic Association Grading Standards for United States Coins. It notes that, "Coins of this design are often weakly struck, particularly in the drapery lines, on the hair at left of the neck, and on the eagle's breast and feathers. File adjustment — a normal part of the manufacturing process — are occasionally seen." Since many collectors are not familiar with the term "adjustment marks," I'll describe these. When the planchets for silver or gold coins were found to be overweight, they were filed across their faces until enough metal had been removed to place them within legal tolerance. This action left the planchets with recessed lines of varying depth and direction. When the planchets were then struck into coins, some of these lines were obliterated by the compression of the dies. Others, however, remained visible, particularly where they crossed the dies' cavities, the area of least compression. 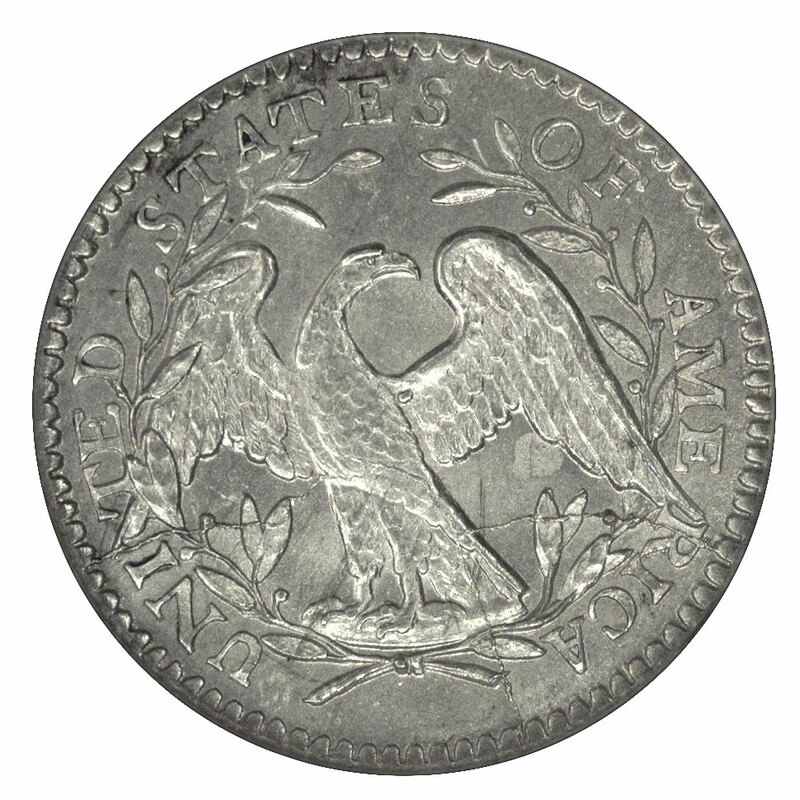 (The Mint eventually realized that filing the planchets' edges was less likely to mar the finished coins, and adjustment marks are seemingly unique to the first dozen years or so of federal coinage.) Though visually distracting, when not too deep these lines don't detract from a coin's grade. Other peculiarities that can affect the grading of Flowing Hair half dimes include die cracks and die breaks, some of the latter being quite large. The ideal type coin should be one sharply struck from an early state of the dies in which there are no such flaws. Coins matching this description are exceedingly rare, and some compromise may be necessary whether one is seeking a well-worn example or one in mint state. Uncirculated coins of this type are scarce but not rare in absolute terms. Walter Breen reported that a hoard of about 100 1795 half dimes turned up more than a century ago, and these pieces probably account for most of the certified mint state examples. Circulated Flowing Hair half dimes are likely to be very heavily worn. The certified population doesn't reflect this fact, since such pieces are seldom submitted, and when they are submitted are more likely to receive an NGC Details Grade due to detrimental surface conditions of one sort or another. In addition to heavy wear, most examples show some evidence of damage or harsh cleaning. Both problems will preclude coins from being certified by the major grading services such as NGC. Due to the thinness of their planchets, these early half dimes are also quite susceptible to becoming bent, another cause for rejection by grading services. Problem-free, attractive coins of any grade are very scarce and highly sought by knowledgeable collectors.